Lately there has been a lot of chatter about Facebook Messenger bots. That hype is backed by a solid number too: there are an estimated 1.2 billion Facebook Messenger users as of Q1 2017, and the platform is adding thousands of new users every day. Regardless of what you are selling, you can bet that your ideal customers, clients or users are on Messenger. With more and more people using mobile devices over desktops and laptops to go online, it’s critical that your lead gen systems keep up with changing behavior patterns. This is why you should pay attention to messaging apps, because it’s much more natural to text something in a chat than fill out a form on a small smartphone, like those forms on landing pages that Facebook ads send traffic to. Don’t believe me? Check out this video where I show how the typical Facebook lead gen ads > Landing page funnel might not give you the results you were hoping for. Messenger chatbots are ideal in such scenarios: they are already optimized for mobile , and because they keep users on Facebook, any messenger ads that you run will cost you less than a typical ad which sends traffic off platform. Before we continue there’s something you need to know: these chatbots aren’t intelligent like Siri or Google Now. They can’t hold a natural conversation with you, and the third party chatbot tools have a long way to go before they can beat the Turing test. Allow users to compare insurance rates. Update viewers before the start of a webinar. A chatbot will offload routine and tedious tasks from your sales and customer support teams so that they can spend time tackling more important issues. Chatbots don’t take an off day, or have office hours, or step outside for a coffee break. In a time where customers demand immediate responses, and where the attention span of people is less than that of a goldfish, the real-time nature of conversational chatbots ensures that your business makes a great first impression. Asks your prospect a series of questions, and based on their response, gives them more information about your offer. Collects email, phone number, first name, last name, feedback etc automatically in a Google Sheet. Qualifies your leads on the basis of budget, location, industry etc. For the actual bot, we can either code it from ground up or use one of the many bot builders. The first option will give you a more powerful bot but it needs developer resources and time. We are going to use Chatfuel as a bot builder though you can use other tools like Manychat, Botsify or It’s Alive. Chatfuel is free to get started. 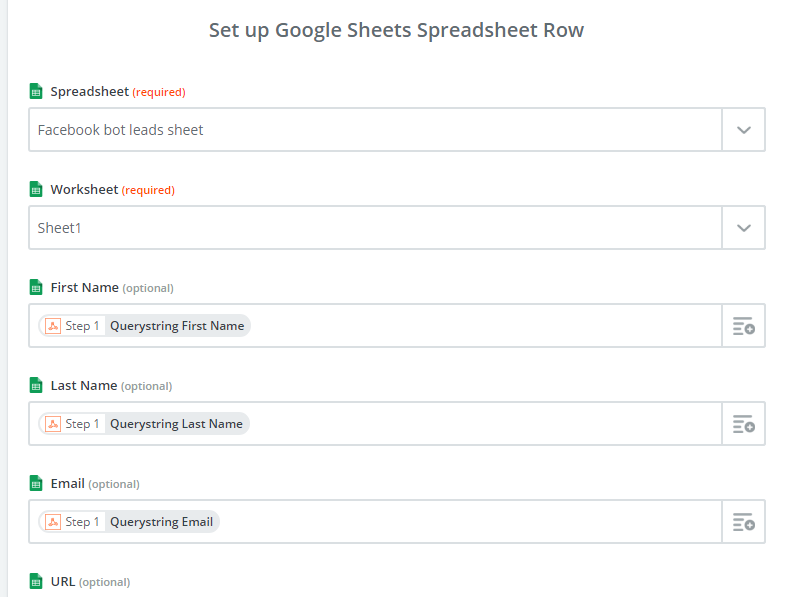 Once the bot is built, we are going to use Zapier to pull the information your leads has shared into a Google Sheet. So the workflow is Chatfuel > Zapier >Google Sheets. But before you get your hands dirty with Chatfuel you should take a step back and sketch out the conversation flow inside the chatbot. This step is critical because the conversation flow will determine whether people are getting value out of the chatbot and getting their questions answered. Mess up here, and you will have high abandonment rates and pissed off users with a bad first impression of your brand. 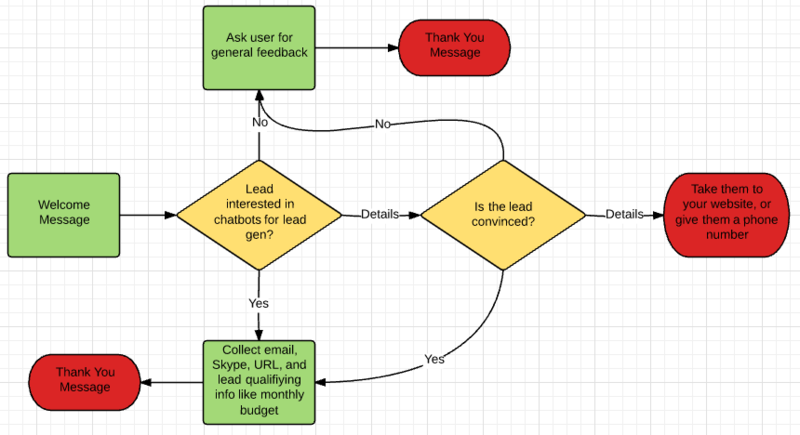 This flowchart shows the user flow for our lead gen chatbot. The elements on this flowchart will occupy different blocks inside the Chatfuel bot (we will talk about blocks in the next section). Take some time to do this. Use language that your customer is familiar with, and make sure that you maintain the natural conversational flow as you jump from one block to another. Done? Now comes the actual building of your bot. Go to the Chatfuel website and click on the big blue button. You will be prompted to sign in with Facebook. Once you are logged in, you will see a dashboard with options for creating different types of chatbots and tutorials that you can follow. For now, click on the orange button which says “Create a blank chatbot”. You will land on the bot builder page. A Chatfuel bot is made up of blocks. 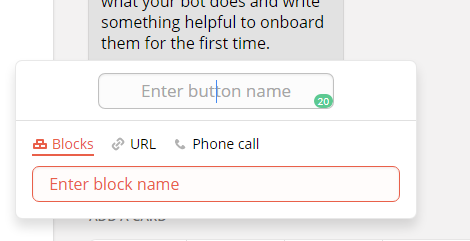 On the bot builder page, you will see two default blocks: one for welcome message, and another for default answer, which pops up when the user does something unexpected and steers them back into the conversation. You can also set up AI rules so that the bot has some flexibility with challenge-response, but that’s for a later date. Clicking on the Add Button allows you to link different blocks together, take users to an URL, or prompt them to make a phone call. Inside a block, you can add different cards to show different types of content. For instance, the welcome message uses a Text Card. You can add images with an Image Card, and add a menu with a List Card. We are going to primarily use the text card and the typing card (the typing card makes it seem like someone on the other end is typing). Click on the +, and you will get a list of plugins that we will use for building our bot. In the Bot Structure section, I have created several groups roughly corresponding to the flowchart that I created above. The Welcome message greets the users and asks them whether they would want lead gen services. If you are sending traffic through a Facebook ad, your prospects might not need further chitchat. This is where users can also choose to engage more deeply with the bot or exit. We will use the User Input plugin to collect response. Here’s how I am using it to collect email and website URL. This plugin can also validate user input values. At the end of this block, the Go To plugin takes the user to the Lead Scoring block where I ask some basic questions to qualify my leads on the basis of budget. You can follow these two basic plugins to gather all the information you want, and control the flow of the user through the chatbot. Once you are done building out the blocks and the groups, the user data has to be funneled through to Google Sheets using Zapier. Before doing that, we will be using the JSON API plugin to collect the data. Here’s how you will set it up. For the URL we will have to first create a Wehbook as a trigger inside Zapier. Log into Zapier, or create a free account. Zapier is a magical app which makes you an automation god. The principle behind Zapier is simple: a trigger creates an action. For us, the trigger will be a Webhook. 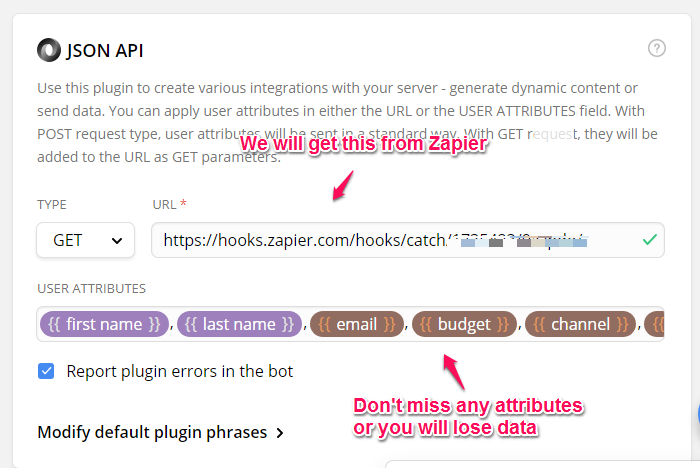 Once you are in the Zapier dashboard, you will choose a trigger app. Select Webhooks. Click on the Catch Hook option, and click Continue. In the View Webhook page, copy the long URL and add it to the JSON window inside Chatfuel. Leave the Edit Options page as is. For the Action, we will choose Google Sheets as action app. Set up a new Google Sheets spreadsheet, and create columns according to the attributes you have chosen in the JSON API step. Connect Zapier with Google, pick the correct sheet and Zapier will automagically pull all the rows. I had some issues at this stage but after a bit of fiddling around Zapier gave me the green light. And then, set up your Zap. You are now all set for testing your chatbot. Go back to Chatfuel and click on the blue button at the top of your dashboard. You should also connect your Chatbot to your page. If you have done everything correctly, you should have a completed row inside Google sheets. Check out the behind the scenes walkthrough. Wanna try the lead gen chatbot? This chatbot is perfect for your messenger ads. 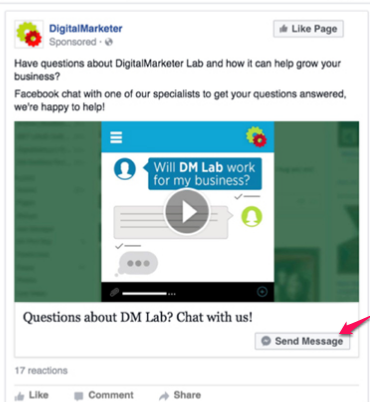 Digital Marketer has written a thorough guide on how they are using Facebook Messenger ads to improve user engagement and be more responsive. For more reading on how chatbots are being used in business, check out Chatbots Magazine. Want a Facebook lead gen bot just like this? Click on the button below, send me your details and let’s talk.